Being a thru-hiker is like being a little kid, we’re constantly bumping into things and getting scratches and bruises. If it isn’t broken and doesn’t need stitches or antibiotics we tend to brush it off, keep hiking, and forget about it. Getting us to go into town to seek medical attention takes something either really obvious or really unusual. Back in Warner Springs (day 7 of my PCT adventure and now 21+ days ago) I’d done something to my hand… I wasn’t sure what, but as I went to set up my tent I noticed that my right hand was really swollen. I looked at it, all ballooned up, and wondered what I’d done. I had no idea. I took some Aleve, tried to keep it elevated, and iced it with the only cold thing I had available to me (a can of tekate beer that some trail angels had brought over to give to the Russian hikers I was camping with). As the days turned into weeks and my hand remained swollen I started worrying about… Swelling for a day or two is one thing… Swelling that persists for weeks despite using the daily maximum dose of NSAIDS is a completely different thing. Not only that, the dang thing had started hurting… That definitely wasn’t right! When my parents came to town I took advantage of the availability of a car and had them take me to a walk-in clinic (the doctor’s office) to get it checked out. At the clinic I showed the doctor my poor swollen hand and explained that it had been swollen for about three weeks and pointed out to him where the points of tenderness were (with three weeks to poke, prod, and puzzle over the injury I definitely knew exactly where it hurt and which movements aggravated it even if I didn’t know how I’d done it). He looked at it, poked it and made solid eye contact with me as he said, “that’s a very common location for fractures,” before asking me again how I’d done it. I told him that I wasn’t really sure, I didn’t remember exactly what I did to it, but I did know when I’d done it since I’d written about it in my paper journal the day that it happened. “Are you sure that you didn’t get drunk and get into a fight? That’s usually how people get this type of injury.” Though I was impressed by his non-gendered assumptions I was quite sure I hadn’t gotten drunk and that I hadn’t gotten into any fights. I’d had a sum total of one beer in the last two weeks and that was the one I’d used to ice my hand with after I’d noticed that it was incredibly swollen. He nodded his head and said that if it wasn’t broken it was definitely severely sprained and that I’d need to wear a brace (unless I needed a cast), but that either way I would be able to keep hiking. With that he fitted me with a brace and sent me off to get x-rays. 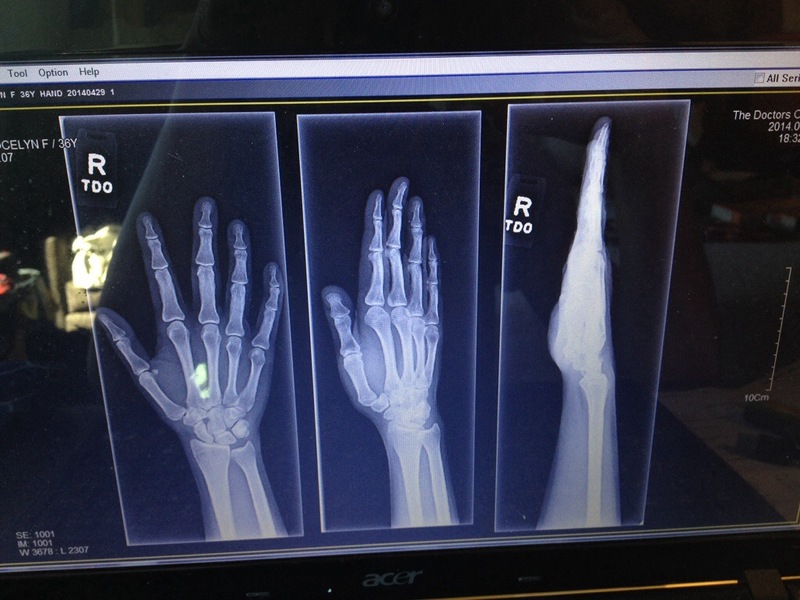 While I was eating dinner the doctor on call called with the x-Ray results and said that I had not one, but three spiral (or stress) fractures in my hand and that since I had waited so long between the initial injury and the x-Ray there was already new bone growth around them. Since they were healing well, they didn’t think I needed a cast and suggested I continue wearing the brace and take it easy with my hand for a while. I was shocked! Sure I’d thought there might be one fracture in there, but three?! I puzzled over it, trying to figure out how I’d managed that one. The next day as I hiked I rolled my right ankle and caught myself with my right hiking stick and finally remembered how I’d hurt my hand. Hiking into Warner Springs on day 7 was the only other time that I’d rolled my ankle. The sharp pain in my ankle and the thought that if it was really badly sprained I might have to get off of the trail completely distracted me from the pain in my hand… I knew that my hand wasn’t going to force me off of the trail so I ignored it and completely forgot about is as an irrelevant detail. Perhaps it wasn’t so irrelevant after all! Later a different doctor called me (from the same office) and said that he didn’t see the stress fractures but that stress fractures are notoriously hard to see on x-rays. He followed that up by saying that the doctor that had spoken to me the night before was a rheumatologist with a lot of experience reading hand X-rays and that he trusted her opinion. Despite the confusion, he said that keeping an eye on it and wearing the brace is the thing to do! 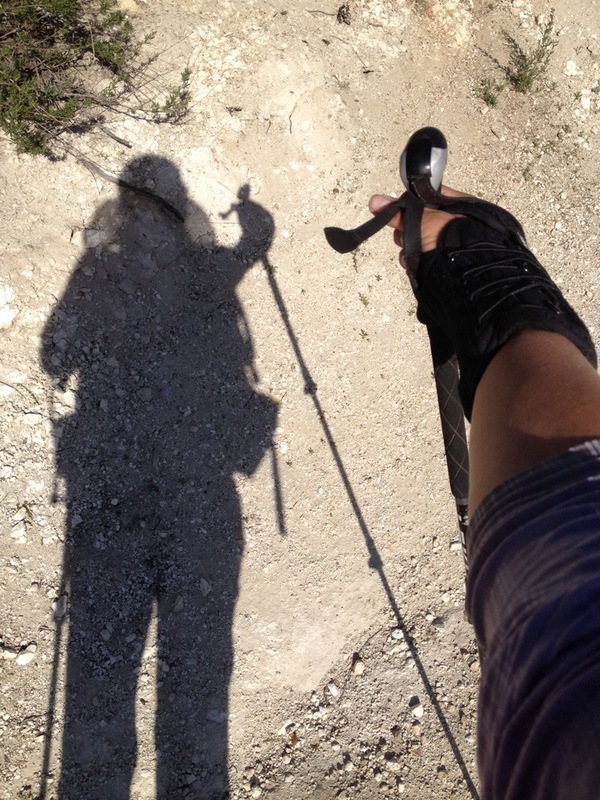 This entry was posted in Pacific Crest Trail and tagged hand stress fracture, hiking poles, pacific crest trail, PCT, stress fracture, walk-in clinic, warner springs. Bookmark the permalink. Just read about your hand…if you hurt it again, or it worsens, please seek help!!! For about 15 years now I’ve suffered with broken bones in my feet, once there were 7 breaks at one time!!! I try to smile thru it, and claim “Since they are still hitched on to me, I’m fine” Sprains hurt 100% worse than a break, in my humble opinion, so stay strong, stay smart & enjoy this wicked awesome adventure!!!! !